Babaee Tirkolaee, E., Alinaghian, M., Bakhshi Sasi, M., Seyyed Esfahani, M. (2016). Solving a robust capacitated arc routing problem using a hybrid simulated annealing algorithm: A waste collection application. Journal of Industrial Engineering and Management Studies, 3(1), 61-76. E. Babaee Tirkolaee; M. Alinaghian; M. Bakhshi Sasi; M. M. Seyyed Esfahani. "Solving a robust capacitated arc routing problem using a hybrid simulated annealing algorithm: A waste collection application". 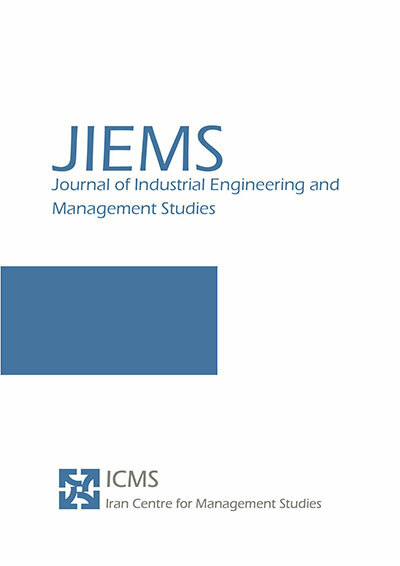 Journal of Industrial Engineering and Management Studies, 3, 1, 2016, 61-76. Babaee Tirkolaee, E., Alinaghian, M., Bakhshi Sasi, M., Seyyed Esfahani, M. (2016). 'Solving a robust capacitated arc routing problem using a hybrid simulated annealing algorithm: A waste collection application', Journal of Industrial Engineering and Management Studies, 3(1), pp. 61-76. Babaee Tirkolaee, E., Alinaghian, M., Bakhshi Sasi, M., Seyyed Esfahani, M. Solving a robust capacitated arc routing problem using a hybrid simulated annealing algorithm: A waste collection application. Journal of Industrial Engineering and Management Studies, 2016; 3(1): 61-76. 2Department of Industrial Eengineering, Isfahan University of technology, Isfahan, Iran. 3Department of Industrial Engineering, Mazandaran University of Science and Technology, Babol, Iran. The urban waste collection is one of the major municipal activities that involves large expenditures and difficult operational problems. Also, waste collection and disposal have high expenses such as investment cost (i.e. vehicles fleet) and high operational cost (i.e. fuel, maintenance). In fact, making slight improvements in this issue lead to a huge saving in municipal consumption. Some incidents such as altering the pattern of waste collection and abrupt occurrence of events can cause uncertainty in the precise amount of waste easily and consequently, data uncertainty arises. In this paper, a novel mathematical model is developed for robust capacitated arc routing problem (CARP). The objective function of the proposed model aims to minimize the traversed distance according to the demand uncertainty of the edges. To solve the problem, a hybrid metaheuristic algorithm is developed based on a simulated annealing algorithm and a heuristic algorithm. Moreover, the results obtained from the proposed algorithm are compared with the results of exact method in order to evaluate the algorithm efficiency. The results have shown that the performance of the proposed hybrid metaheuristic is acceptable. Beltrami, Edward J., and Lawrence D. Bodin., 1974. "Networks and vehicle routing for municipal waste collection." Networks 4.1: 65-94. Bertsimas, Dimitris, and Melvyn Sim., 2003. "Robust discrete optimization and network flows." Mathematical programming 98.1-3: 49-71. Bertsimas, Dimitris, and Melvyn Sim., 2004. "The price of robustness." Operations research 52.1: 35-53. Chen, Lu, et al., 2014. Optimizing road network daily maintenance operations with stochastic service and travel times." Transportation Research Part E: Logistics and Transportation Review 64: 88-102. Chen, Yuning, Jin-Kao Hao, and Fred Glover., 2016. "A hybrid metaheuristic approach for the capacitated arc routing problem." European Journal of Operational Research. Fleury, Gérard, Philippe Lacomme, and Christian Prins, 2004. "Evolutionary algorithms for stochastic arc routing problems." Applications of Evolutionary Computing. Springer Berlin Heidelberg. 501-512. Golden, B., Wong, R., 1981." Capacitated arc routing problems." Network, vol.11, pp.305–315. Golden, Bruce L., Arjang A. Assad, and Edward A. Wasil., 2001. "Routing vehicles in the real world: applications in the solid waste, beverage, food, dairy, and newspaper industries." The vehicle routing problem. Society for Industrial and Applied Mathematics. Kirkpatrick, S., & Vecchi, M. P., 1983. Optimization by simmulated annealing. science, 220(4598), 671-680. Laporte, Gilbert, Roberto Musmanno, and Francesca Vocaturo., 2010. "An adaptive large neighbourhood search heuristic for the capacitated arc-routing problem with stochastic demands." Transportation Science 44.1: 125-135. Santos, Luís, João Coutinho-Rodrigues, and John R. Current., 2010. "An improved ant colony optimization based algorithm for the capacitated arc routing problem." Transportation Research Part B: Methodological 44.2: 246-266. Taguchi, Genichi, Subir Chowdhury, and Yuin Wu., 2005. Taguchi's quality engineering handbook. Wiley-Interscience,. Vincent, F. Yu, and Shih-Wei Lin., 2015. Iterated greedy heuristic for the time-dependent prize-collecting arc routing problem." Computers & Industrial Engineering 90: 54-66. Willemse, Elias J., and Johan W. Joubert, 2016. Constructive heuristics for the Mixed Capacity Arc Routing Problem under Time Restrictions with Intermediate Facilities." Computers & Operations Research 68: 30-62.